This exhibition of drawings and paintings by British artist Roger Hilton (1911–1975) brings colour, light and a return of the figure to Tate St Ives. Hilton painted his first abstract work in 1950 and by 1952 he was constructing bold designs of irregular shapes in strong colours where affinities lay with art informel and his friend, the Dutch artist Constant. The influence of Piet Mondrian's work is also evident by the mid 1950s in the colour schemes of white, black and red that he briefly adopted in paintings such as February–March 1954. However, his association with the St Ives artists – consolidated by his frequent visits to that town from the late 1950s – no doubt underpinned the landscape associations in his work at that time. 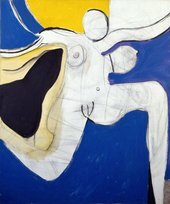 Inspired by contemporary European post-war abstract trends, Hilton's figurative paintings became more concerned with the act of painting and increasingly abstract. Aligned initially with constructivists in Lawrence Alloway's show of 1954 Nine Abstract Artists, his use of rich colour and texture evoking the rhythms of natural phenomena led to an affinity and association with the modernists working in St Ives from the mid 1950s. 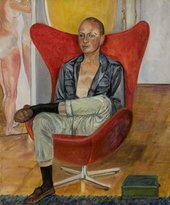 By the end of the decade Hilton returned to 'reinvent figuration', demonstrating not only his frustration with the limitations of abstract painting and rejection of American Abstract Expressionism in favour of the European tradition, but also his discovery that images could be generated from the process of painting itself. Hilton's colourful dynamic images of women successfully bridged the gap between abstraction and figuration and also between images of the figure and the landscape.